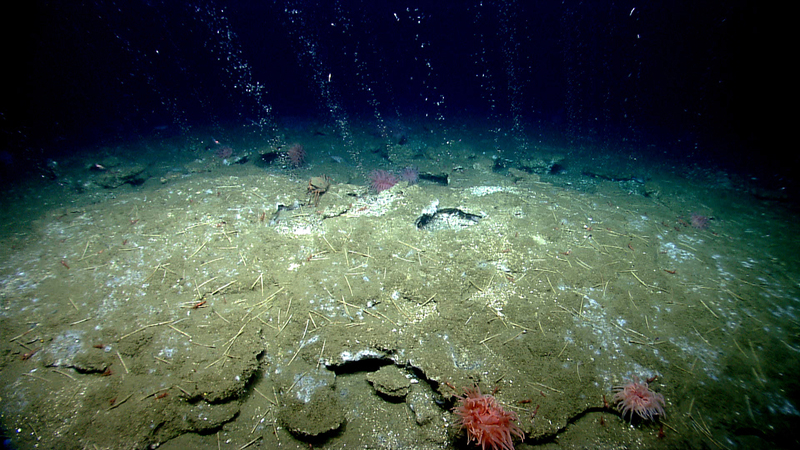 Methane bubbles flow in small streams out of the sediment on an area of seafloor offshore Virginia north of Washington Canyon. Quill worms, anemones, and patches of microbial mat can be seen in and along the periphery of the seepage area. Image courtesy of the NOAA Office of Ocean Exploration and Research, 2013 ROV Shakedown and Field Trials in the U.S. Atlantic Canyons. Download larger version (jpg, 1.6 MB). The continental shelf and slope off the northeastern U.S., the underwater edge of the continent that borders the Atlantic Ocean basin, hosts an incredible diversity of habitats including approximately 70 submarine canyons ranging from depths of approximately 100 meters to 3,500 meters, etched by rivers thousands of years ago when this region was above sea level. These canyons remain little explored but the topography, currents, and sedimentation in and around these submarine canyons support complex systems including chemosynthetic ecosystems in the form of cold seeps. 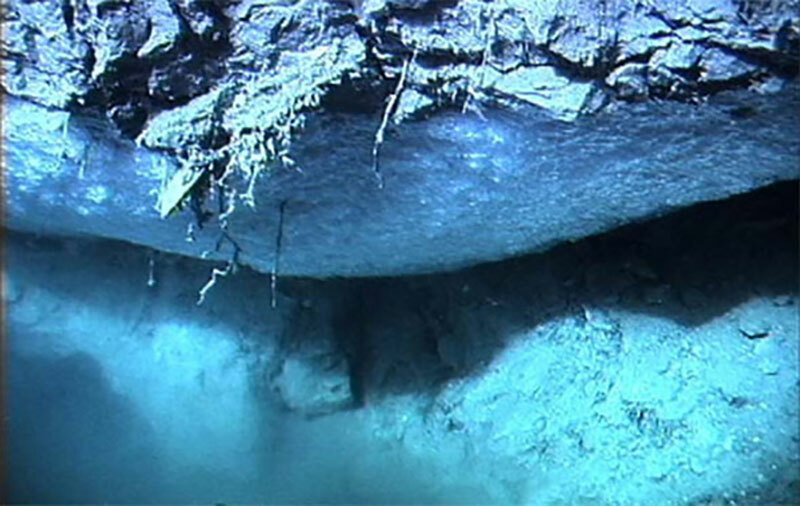 Cold seeps are patchily distributed, ephemeral environments that occur most frequently along tectonically active and passive continental margins from intertidal to hadal depths, in areas of the seafloor where hydrogen sulfide, methane, highly saline water, and other hydrocarbon-rich fluids escape into the water column. This process can result in the formation of oil seeps, methane, and gas hydrate seeps; brine seeps; pockmarks; and mud volcanoes, although methane seeps are common along continental margins in areas of high primary productivity where crustal deformation and compaction drive emissions of methane-rich fluid. 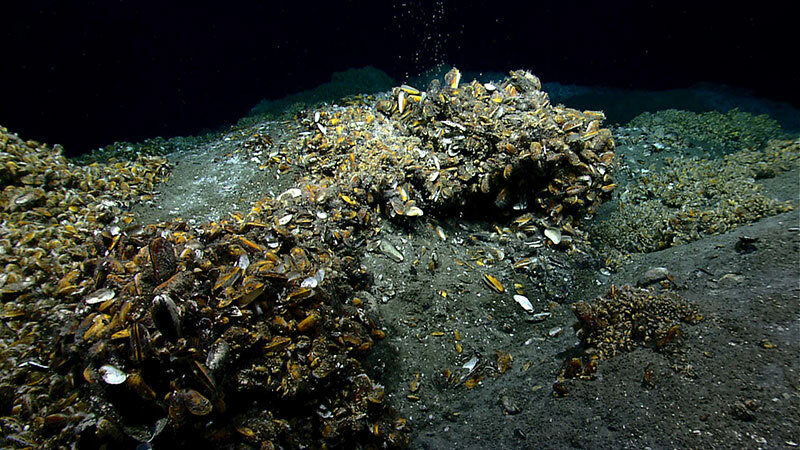 Methane gas hydrate formed underneath a rock overhang at the seafloor on the Blake Ridge cold seep off the coast of South Carolina. Image courtesy of the NOAA Deep East Exploration 2001. Download image (jpg, 90 KB). Seeps have global significance for the transfer of methane carbon from long-term storage in ocean-floor sediments into the ocean where methane released into the water column can be oxidized to carbon dioxide, often leading to changes in ocean chemistry. The discovery and mapping of deep-ocean seeps is essential to understanding the future global carbon budget and renewable energy resources, including hydrocarbon and gas hydrate reservoirs along the U.S. continental slope. Map showing bathymetric data collected along the U.S. Atlantic coast. The locations of seafloor gaseous seep discoveries between 147 and 163 kilometers off shore, with one site east of Cape Henry, Virginia, and two sites south and southeast of Nantucket Island, Massachusetts (at water depths of 300 to 1,600 meters) are indicated with a red circle. Image courtesy of the NOAA Office of Ocean Exploration and Research. Download larger version (jpg, 1.4 MB). Seeps are now known to exist throughout almost all depth ranges and in all of the global oceans. 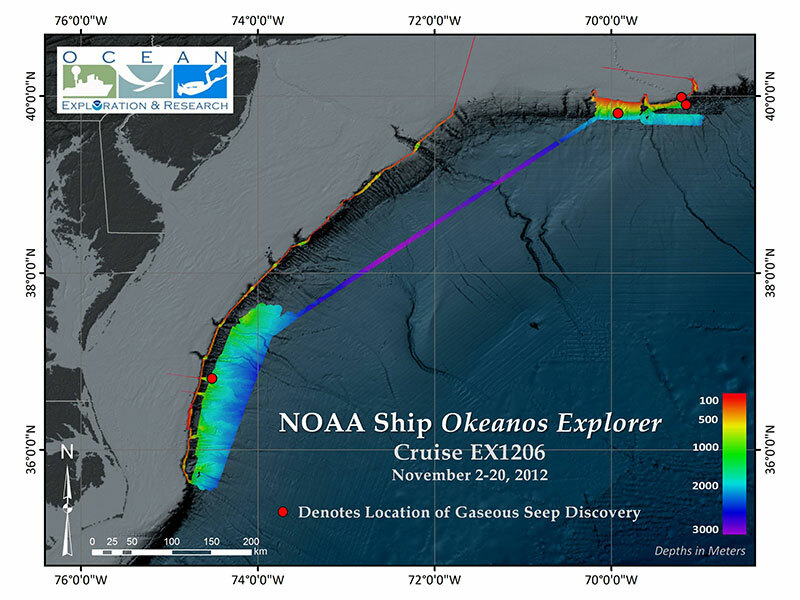 In 2012, approximately 50 potential distinct seafloor gas seeps were identified by the Okeanos Explorer multibeam sonar along the Eastern U.S. continental margin and these were targeted sites for follow-on investigation in the spring and summer of 2013. Since these initial discoveries, a substantial number of potential seep sites have been identified in Okeanos Explorer water column mapping data. Biological communities associated with deep-water seep environments are fueled through the process of chemosynthesis (deriving energy from chemical compounds instead of light) and also chemoautotrophic symbiosis (using a symbiont to derive energy from chemical compounds). In the Western Atlantic, seep communities have been described from mud volcanoes and diapirs between 1,000 and 5,000 meters depth in the Barbados accretionary prism area and from the Blake Ridge diapir at a depth of 2500 m off the coast of South Carolina. 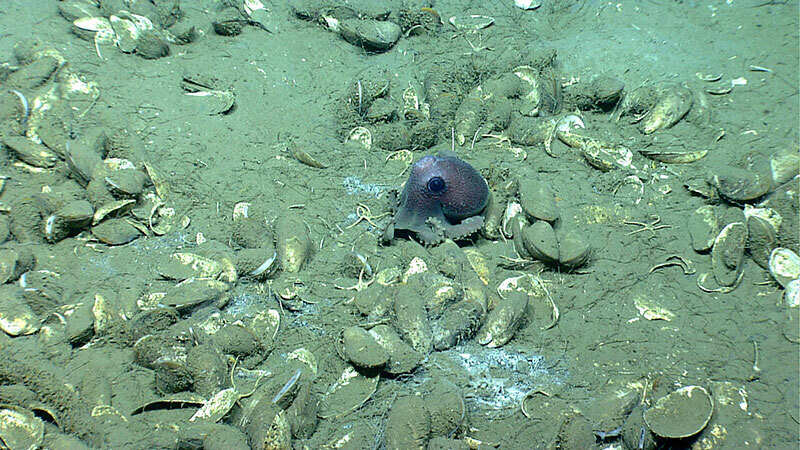 Within the past two years, many more seep locations have been discovered off the Eastern Coast of the United States in the Northern Atlantic (Okeanos Explorer cruises EX1201, EX1204, EX1205L1, EX1205L2, EX1206, EX1301, EX1302, EX1303). A newly discovered mussel bed with octopus Graneledone verrucosa and brittle stars on sediment and white microbial mat at a seep site south of Norfolk Canyon. Image courtesy of the NOAA Office of Ocean Exploration and Research, 2013 ROV Shakedown and Field Trials in the U.S. Atlantic Canyons. Download larger version (jpg, 1.4 MB). In the spring of 2013, during the Deepwater Canyons cruise, a new seep site previously detected with Okeanos Explorer’s multibeam sonar near Norfolk canyon was investigated and an extensive seepage area of at least a kilometer long and hundreds of meters wide was discovered, hosting large communities of bathymodiolid mussels and red crabs. Sea cucumbers, fish, and shrimp were also seen living associated with the seep. An engineering field expedition to the North Atlantic canyons with the Okeanos Explorer and new remotely operated vehicle (ROV) Deep Discoverer in May of 2013 yielded several new seep discoveries, including one photo-documented with high-definition imagery near Veatch Canyon off the coast of Cape Cod, Massachusetts. Overview of extensive chemosynthetic mussel communities colonizing carbonate and sedimented mounds at a seep site south of Norfolk Canyon. Image courtesy of the NOAA Office of Ocean Exploration and Research, 2013 ROV Shakedown and Field Trials in the U.S. Atlantic Canyons. Download larger version (jpg, 1.6 MB). Cold seeps develop unique topography over time, where reactions between methane and seawater and in many cases, the influence of microbial activity, create carbonate rock formations and habitat for diverse faunal assemblages. When methane seepage decreases, the dominant fauna supported by the reduced chemicals decrease in abundance and as the seep becomes inactive, carbonate deposits can become potential habitats for other non-seep organisms, such as cold-water corals. 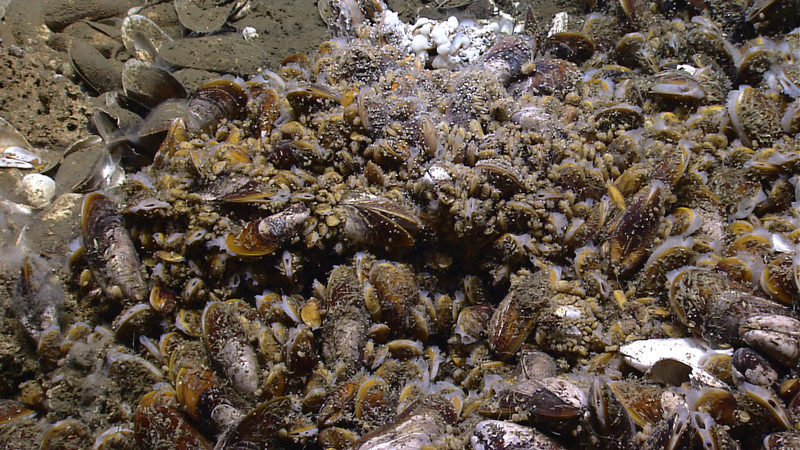 Close-up view of a live chemosynthetic mussel bed surrounded by sediment-covered shells from 1,419 meters depth in Veatch Canyon on the U.S. continental margin. Gastropods could be seen in high abundances on the live mussel shells and white microbial material (top center of image) was observed within and around the seep site. Image courtesy of the NOAA Office of Ocean Exploration and Research, 2013 ROV Shakedown and Field Trials in the U.S. Atlantic Canyons. Download larger version (jpg, 1.7 MB).